Decent on its own. Probably not worthy of a deck slot by itself, but it does have synergy with a number of things already, like Quest Druid, Beast tribe, or Odd decks in general. Pack filler. Could be good in arena. Bad pack filler card. 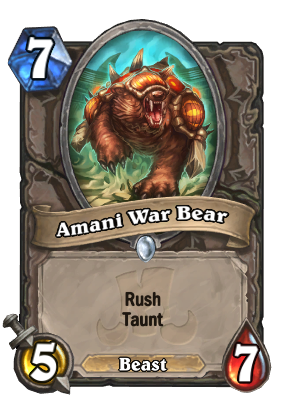 Rush and Taunt don't go well together, and this card is poorly statted in both respects. Like the flavour. Think it might be arena/packfiller. I wasn't planning on going for a run today. But those cops came out of nowhere. it may go with recruit hunter, but i doubt it. Could be used with other new card Revenge of the Wild. Rush beasts are cool. They print alot of 7 drops this expansion..
this is actually quite decent, but for arena I guess, in constructed it doesn't do enough. Solid arena card. That's about it though. They just slapped numbers and keywords together. It doesn't even fit the flavour of a mount. It's cute and all, but I don't think it fits into anything currently. Maybe there's some Big Beast Druid with Quest that can make use of this, but I doubt it. they should have dropped the taunt and put it at 6-mana, then there might be some consideration. However, it does have 7 health, which puts it in Star Aligner range, for whatever that'S worth. I really like these uneven stats. I wished Lich King was a 6/10 instead of the classic 8/8. 90% of the time, this will deal 5 damage to a minion, leaving a 5/x with taunt on the table where x is 7 minus the power of the minion which this killed. That isn't so bad. It interracts at least twice with your opponent before your next turn and likely kills 2+ enemy minions, at least one of which you get to choose. Of course, I'm not claiming that this will have a genuine impact on the meta, but it passes the test for expensive minions to impact the board from the moment that it is played. Fake reveal? Not on Blizzards playhearthstone page or schedule and not ‘revealed’ by the usual mods. Or is this a leak?